Lock Into The Perfect Groove Of Chris Dave's 'Destiny N Stereo' You've heard his drumming on records by Adele, Perfume Genius and D'Angelo. Soon, his shape-shifting band is going to release its debut album. Chris Dave possesses innumerable gifts as a drummer, but chief among them is the ability to make a groove just feel ... right. This isn't as simple or straightforward a feat as it sounds. And it can be a recipe for invisibility, at least among the general listening public. For the smaller circle of admirers who make a point of checking the album credits, Dave is already a kind of legend, with a hand in everything from the new Perfume Genius album to Adele's blockbuster 21. Dave was also the indefatigable rhythm engine on worldwide arena tours by D'Angelo and Maxwell. And of course, he was a founding member of the Robert Glasper Experiment, which won a Grammy for Best R&B Album in 2013. The Drumhedz, a shape-shifting concern that Dave formed around that time, pursues a similar nexus of black music: underground hip-hop, astral R&B, groove-forward jazz, spirit-minded soul. Some musicians in the fold, like bassist Pino Palladino and guitarist Isaiah Sharkey, are fellow alumni of The Vanguard, D'Angelo's touring band. Others, like trumpeter Keyon Harrold and keyboardist James Poyser, are fellow travelers in this convergence of styles. Dave has promised a full-length album from this crew for years, and it's finally on the near-horizon: Chris Dave And The Drumhedz is due out on Blue Note early in the new year. It features some four dozen musicians from the larger Drumhedz family, and guest vocals by Anderson .Paak, Anna Wise, Kendra Foster and Goapele, among others. 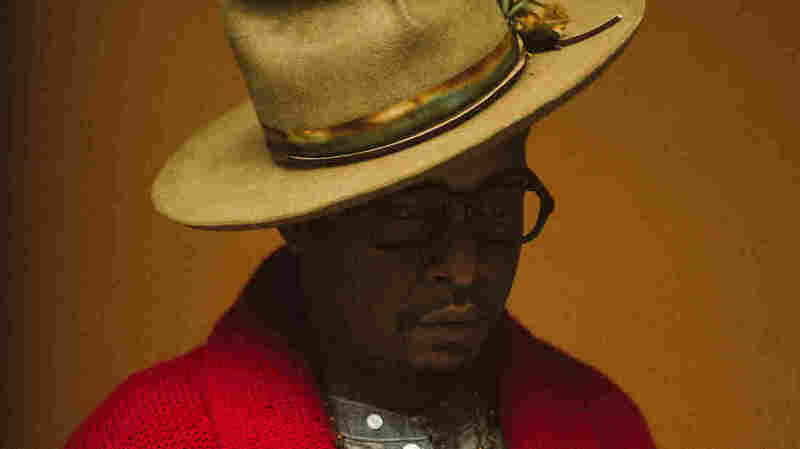 The album's lead single, "Destiny N Stereo," features a soulful hook sung by Eric Roberson, and surefooted rap verses by Elzhi, formerly of Slum Village, and Phonte Coleman, formerly of Little Brother. Opening with a montage of ambient radio samples, the track settles into a head-nod beat reminiscent of Dave's rhythm lodestar, the revered producer J Dilla. It's a good first taste of an album determined to stretch out from a baseline of groove, while keeping both feet on the ground. As Elzhi puts it here, "I know these lines are up high above your head propelling / Y'all hit the mainstream to catch air time something like parasailing." Chris Dave And The Drumhedz comes out Jan. 26 via Blue Note Records. This article originally stated that Chris Dave played drums on Adele's "Set Fire To The Rain." The drums for that song were performed by Ashley "Ash" Soan.